There was a time when a baby monitor was basically a walkie-talkie that sat in the nursery and broadcast to a receiver wherever mum and/or dad were. Then there came video. Your baby monitor was now a little camera and microphone sitting in your baby's cot giving you a live video feed or your sleeping cherub (albeit a very poor quality monochrome one). Then came baby monitors with movement detection and heart beat monitoring. Certain things in my opinion that are just totally unnecessary. However, when you consider that the general cost of technology drops each year as tech gets older and more commonplace (and cheaper to manufacture mostly), it's no surprise that basically everyone now will be likely to buy a video baby monitor. But which is best? When it comes to tech I almost never go by brand or 'container' manufacturer. The truth is that the parts inside generally come from the same handful of places and all you're paying for is someone else to stick their name on it. So once the guarantee is good and the specs give you the service you want, I say buy what suits your budget. The only caveat being that I would suspect you'll want to spend somewhere between €50 and €100. Strictly speaking though, a baby monitor is not the only option when it comes to baby monitors. What I mean is that there are other video and audio devices out there that perform the same function but are not sold as baby monitors. Take for example the Tenvis IPRobot3 (pictured above). 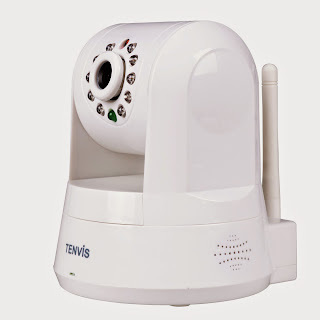 This is an IP Camera meaning that it runs through your home network (wifi or wired in the case of the IPRobot3). It is also significantly higher spec than most baby monitors and definitely a lot cheaper for the specs it has than a baby monitor of similar calibre. The IPRobot3 offers a MegaPixel camera operating in Ultra HD. It also has stunning night vision that provides perfect view in absolute darkness. What I especially like about it is that it can be remotely controlled to rotate on an X and Y axis meaning that you can adjust the camera angle through 360x360 degrees to see in any direction around it. Oh, did I mention that it streams to your smartphone or tablet through a secure protocol? So no matter where we are we can login to the camera and check on Beckett. The IP Camera route does take a small amount of tech knowhow but it's basic and it shouldn't be difficult for anyone to follow the video instructions provided. In short, I would definitely go this route. The Tenvis IPRobot3 cost US$80 including P&P. Great value in my opinion and definitely what I recommend to anyone shopping for a baby monitor. Digital Dad is a lifestyle blog for mums and dads. It covers everything from technology to aid your parenting needs to great recipes and foods that infants and kids will love. To be honest, if it's of interest to me as a new dad, I'll share it with you here.